A Nowata High School geometry class does something special just in time for Valentine's Day. 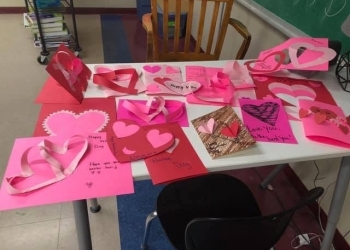 Geometry teacher Chris Ann Truesdell and her students made Valentine's Day cards for the Children's Hospital at the OU Medical Center in Oklahoma City. Mrs. Truesdell explains that she has a niece that works at the hospital. Her neice posted on social media that the hospital was in need of a heartfelt Valentine's Day project, so Truesdell thought it would be a good project for her students to do. She says her students were hesitant at first about the project, but that quickly changed. Once they got started, Truesdell says the students started to enjoy the project and felt good about what they were doing. She says she wanted her students to learn how good it felt to do good for someone else. The students made approximately 80 Valentine's Day cards to send to the children at the Children's Hospital at the OU Medical Center in OKC. Truesdell says this is the first time they did something like this in her class and she looks forward to doing this every Valentine's Day in the future. She may even do this during the Christmas season. The cards recently made by the students were sent on Tuesday after school.